If you don’t already know what giblets are, they’re all the things that come inside the body cavity of a whole chicken. If you’ve bought a whole bird and fished out a bag of little bloody lumps that you kind of looked at sideways before throwing it in the garbage, then you’ve found the giblets (if you’ve bought a whole chicken and don’t remember anything being inside of it, don’t worry: some brands of chicken don’t include them with the bird). To a traditional cook, the giblets were an essential part of the chicken, and the base for all kinds of tasty little treats that added flavor and nutrition to the family diet. But nowadays, they’re more likely to get thrown in the trash – if they even accompany the chicken at all! Too many modern kitchens are missing out on all the ways to use these odd little morsels: here’s how to do it. The giblets may also come packaged with the neck of the bird, again, depending on your bird. Sometimes they’re in a mesh or plastic bag; sometimes they’re just kind of hanging out inside the chicken. Giblets aren’t restricted just to chickens: you’ll also get giblets with the turkey if you buy a whole turkey for Thanksgiving. But most people are more familiar with chicken giblets since it’s rare to buy a whole turkey more than once a year. Because so many cooks just don’t know what to do with them, a lot of factory-farmed chickens don’t even include the giblets any longer, so if none of this sounds at all familiar, you’re not going crazy; you’ve probably just been buying a brand that doesn’t package the giblets with the bird. But if you’re getting your birds from a farmer – or even from most organic or higher-welfare brands – then you should be pretty familiar with “strange little bits of meat inside the body,” even if you didn’t know what they were. What do they taste like? Well, each one tastes a little different. Heart and gizzards taste like dark meat, but a little chewy. Liver and kidneys each have their own distinctive, slightly metallic taste (if you’ve never tasted them, it’s impossible to describe; just try them out for yourself and see). Chicken organs are generally milder-tasting than cow or pig organs. Well, for one thing, it’s free protein. Protein is expensive; why would you waste any of it? (The USDA nutrient database has no information on chicken kidneys, but to judge by beef and pork kidney, they’re nutritious). 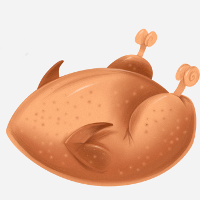 If you eat roast chicken with the giblets once a week, that’s not a bad addition to your weekly nutrient intake! For giblet gravy: here’s a recipe; just replace the flour with almond or coconut flour. You can pour your gravy over mashed potatoes (yes, potatoes are fine to eat, but you could always substitute mashed cauliflower if you don’t eat white potatoes), or eat it with the bird, or both. For giblet stock: just toss the giblets into the stock pot together with the neck, back, wingtips, and other bones or parts of the carcass. You’ll get all the additional nutrition from the organs in your stock along with all the good stuff that’s already there! Pureeing the giblets and mixing the puree into your next batch of meatballs, meatloaf, burgers, stew, or chili? They add a rich flavor without being overpoweringly organ-y. Frying them quickly in hot butter as a snack for the cook after going to all the trouble of cooking the chicken? For anyone who remembers fried gizzards as a childhood treat (they’re very common in the Midwest and South), here’s a Paleo variation. Chopping them small and adding them to an omelet or another egg dish? They’re pretty small, so they add some flavor and interest without being overwhelming. Tossing them into a stir-fry with some vegetables and maybe some extra chicken meat? Even a big batch of giblets isn’t enough protein for a full meal, but if you tossed in an egg or a few rashers of bacon or some other protein, you’d have a quick lunch all set. Freezing them until you’ve accumulated a reasonable collection, and then making them into pâté or some other organ-centric dish? There are all kinds of ways to work them into your cooking, whether you’re excited about enjoying them as a special treat, or more interested in getting all that nutrition without actually tasting them. 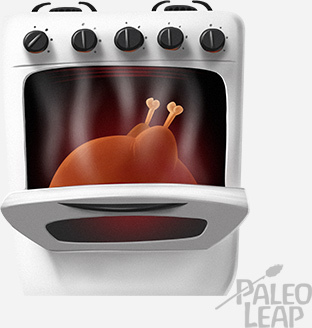 So…are you ready to cook up some giblets? It’s a simple way to start cooking with the “odd bits,” without even having to buy anything extra: why not go for it? Or if you’re a giblet pro, share your favorite recipe tips on Facebook or Twitter!